Do Dogs Need Life Vests to Go Swimming? 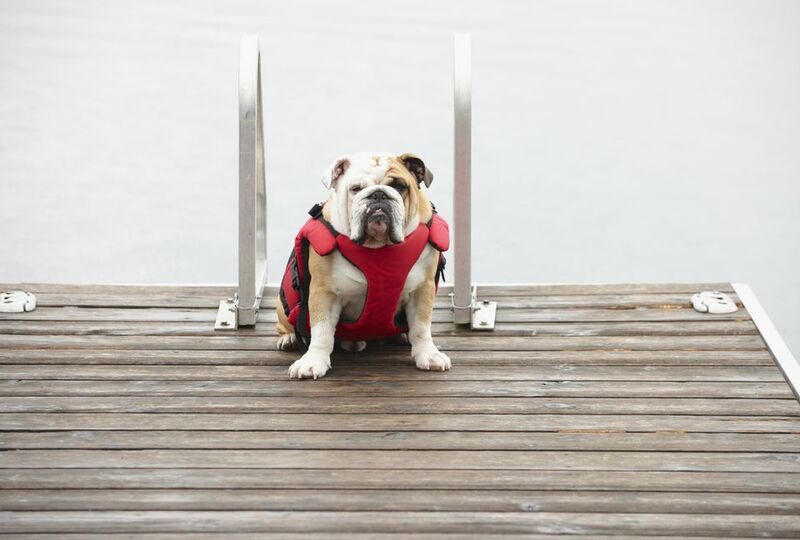 A life jacket for your dog is not just another accessory—it's an important part of an overall safety program that's recommended for any pet that spends time around bodies of water, especially on boats. You might think that all dogs can swim, but this is a common misconception that's perpetuated by the swim stroke referred to as the "doggie paddle." Some breeds of dogs simply do not enjoy being anywhere near water, and some dogs that have low body fat, such as greyhounds and whippets, can have difficulty staying afloat and regulating their body temperature in water. Even these water-loving breeds, such as retrievers and Labradors, can have trouble if they are elderly, sick, or overweight and out of shape. Fatigue can set in, and no matter how good of a swimmer they are, they may tire out and be unable to stay afloat. Fear and anxiety in the water, as when a pet falls in unexpectedly, can hamper normal respiration as well as swimming ability. Waves, undertows, currents, and fast-moving rivers can overtake even the strongest swimmer. Wearing a life vest may mean the difference between life and death for a dog. Although canine life vests aren't required to meet any sort of certifications or standards, but there are certain features that will keep your dog comfortable and safe. Pick between a life jacket and life vest: The former gives buoyancy, visibility, and covers more of the pup. They're recommended for open-water swimming, like if you are on a boat on a lake or in the ocean. Life vests are lighter and don't cover as much, but they're easier for letting the dog swim. They're best for swimming in a pool. Look for a life jacket or vest that has a D-ring that will allow you to attach a leash to the vest, as well as one with a handle on top. This will allow you to grab and lift the dog out of the water if he's in trouble while swimming. Pick a bright color that allows you to easily spot the pup in the water. If your dog has a hard time keeping his head above the water, look for a life jacket or vest that has a front flap that keeps the pup's noggin up. If you're considering a life vest for your pet, talk to other pet owners and boaters. The U.S. Coast Guard, which regulates human life jackets, does not regulate vests for pets, so be sure to have your pet fitted for the vest that will work best. Dogs come in every shape, size, and weight, and you'll need accurate measurements of your dog for a good fit. Measure the dog from the length of his neck to the base of his tail and the girth in two places: the widest part of both his chest and neck. The life jacket or vest should be snug but not too tight that the dog can't run around easily when he's out of the water.